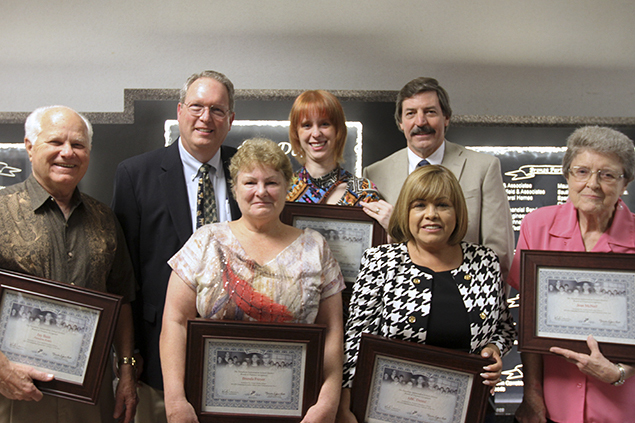 Pasadena ISD Board of Trustees announced the district’s 2014 Volunteers of the Year at the monthly board meeting recently. Board president Mariselle Quijano-Lerma and School Superintendent Dr. Kirk Lewis presented the recipients with awards in several categories. Honored as the Outstanding Large Business Volunteer of the Year was Pinnacle Asset Integrity Services for their commitment to Lomax Middle School as participants in the annual career day, science fair, serving on the site-based decision making committee and donating $2,500 for teacher technology. In the category of Outstanding Small Business Volunteer of the Year, Dr. Iraj Jabbary and his staff at ABC Dental on Southmore Ave. were recognized. They continue to surpass expectations by providing school supplies, bicycles and financial support to the district, namely Freeman Elementary where they provide dental screenings and education for families. The Pasadena Rotary Club represented by Dr. Paul Covell and Jay Bain was named Outstanding Organization of the Year. The Club was honored for their commitment to education through the donation of dictionaries to third grade students at Pearl Hall Elementary as well as their participation in the Early Act First Knight Program at Red Bluff and Morales Elementary School. Incoming fourth grade student Yareli Rosales from Pomeroy Elementary was the recipient of Outstanding Elementary Student of the Year. Yareli volunteered in Brenda Gutierrez’s pre-k classroom helping to prepare for the day. Yareli offered to help Gutierrez without being asked and is also an excellent student herself. Outstanding Secondary Student of the Year is Breye Perkins from Sam Rayburn High School. Perkins has put in over 8,550 volunteer hours in the last four years. Along with her philanthropic activities, Perkins also excelled academically and graduated this year as one of the top ten in her class. Gilbert Perez, a former student of Williams Elementary, was named Outstanding College Student Volunteer of the Year for his dedication to the school’s library. For the past two years, Gilbert has served as a positive influence on students and encourages lots of reading. Honored as Outstanding Adult Volunteer of the Year at an Elementary was Jean McNeill. Ms. Jean as she is known to students has volunteered at Jensen Elementary for 20 plus years. Her unyielding dedication to her school family is one of the many reasons for her nomination and win. In the category of Outstanding Adult Volunteer of the Year for Secondary Schools was Brenda Freyer. Freyer is a full-time working grandmother and guardian of a Lomax Middle School student. She makes time in her busy schedule to help whenever she is needed.